simple soups are my favorite - don't get me wrong, soups that simmer away from morning til' night have their place. 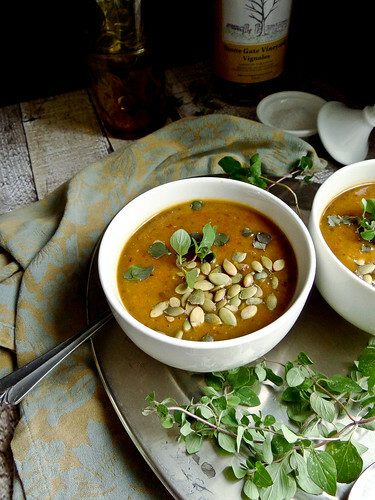 but a soup that comes together can be a weeknight lifesaver especially of you have several hungry bellies to feed in a short amount of time. i am almost willing to bet you have most if not all the ingredients to make this soup sitting in your pantry. black beans, peppers, pumpkin, garlic, cumin, salt & sweetener. the pumpkin adds a nice little hint of fall comfort - it is a great way to use up the last bit of pumpkin you have on hand. even if you do not have a whole can of pumpkin add what you have on hand. soup, stews & chowders simply made warm my heart and my soul. anytime i am having a down day or need a little pick me up a bowl of soup lifts my spirits. funny how a little bowl of goodness can do that. 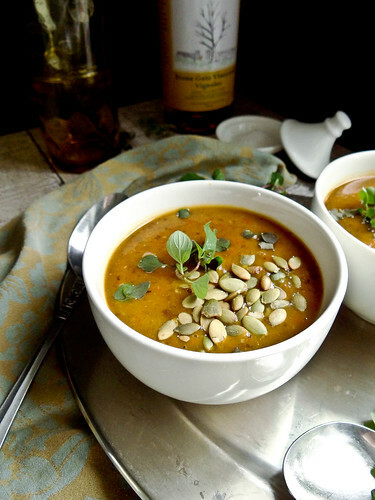 do you have a favorite weeknight quickie soup that you keep on hand for when life gets crazy? in a medium soup pot drizzled with olive oil saute peppers (hot & sweet) & onions over medium heat until fragrant, add garlic and saute for an additional 8 - 10 minutes. add cumin & salt & stir - add black beans, pumpkin & water. stir in honey, remove from heat. with an immersion blender, blend until smooth - or blend in batches in a stand blender with the top vented. garnish with pepita's & oregano or crushed tortilla chips. I know right, I think we need to bring the Savory back to pumpkin :) Loved your pumpkin ravs - so amazing! This soup sounds absolutely perfect! 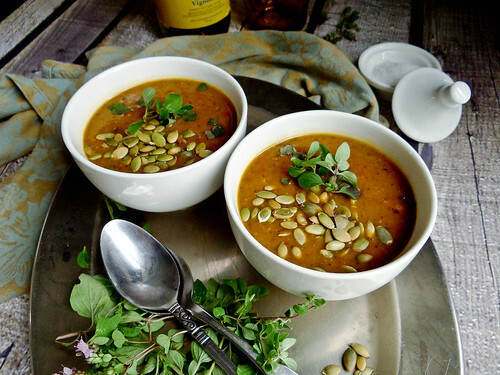 I always love seeing savory uses for pumpkin. I don't know that I have a favorite comfort food, but soup always hits the spot =). Can't wait to make this one! This is so perfect for you! I am loving this soup recipe! It looks so amazing. I am going to have to make this really soon. I think I do have everything for it at home, too! :) Great post! You should make this very soon - it is so good! i love love the first picture! such gorgeous comfort soup. Thanks Richa- I love photographing this one, it was so much fun! 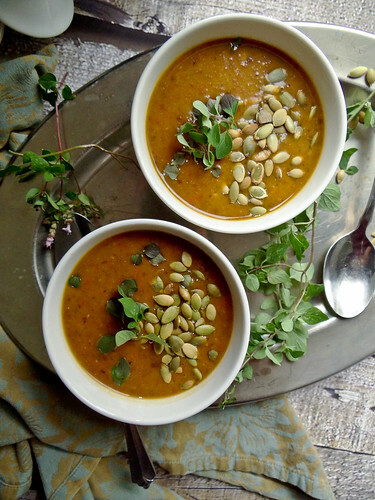 Hearty soups like this are exactly what I want to eat for the entire duration of fall. 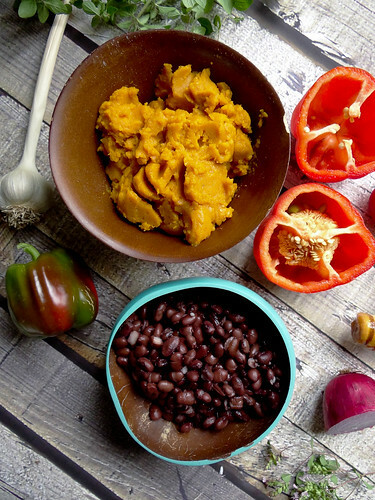 I love the combination of pumpkin and black beans! your soup is the perfect match for this wonderful time! Just found this on FoodGawker and I had to click though because I just happen to have a whole bunch of black beans in the freezer from a post I did about making & freezing beans. :D And I also happen to love pumpkin soup! I think I'm going to make this next week! HI Kiersten I am so happy you stopped by! I love batch cooking beans and storing them away in the freezer, they come in so handy for a recipe just like this! 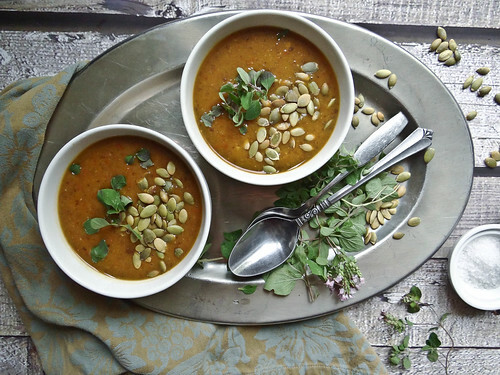 A hearty and delish soup! Well then this is perfect for you! Amazing Heather! I need to start making some soup, it's getting so chilly! I love the idea of putting pumpkin in :) Can't wait to try this! How did you know that I have all these ingredients in my pantry? Thick, rich , creamy soup just the way I like it!!! I am good like that, I actually snuck into to your house before I made this and snooped through your cupboards - I should have named this "Gigi's Cupboard Soup"
I think I may make this for food day at work next week and bring it in my slow cooker. I think it would be a HUGE hit. 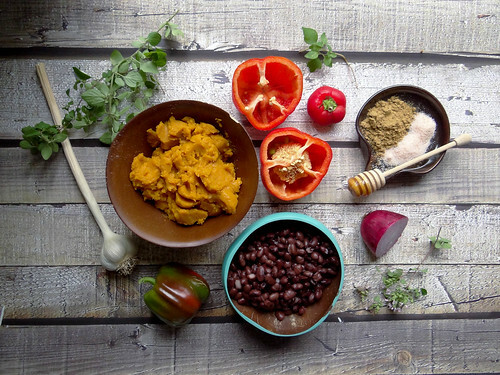 Love the flavours in addition to the pumpkin and black beans. YUM! Awesome idea for a healthy lunch. Lovely photos and a yummy sounding recipe! 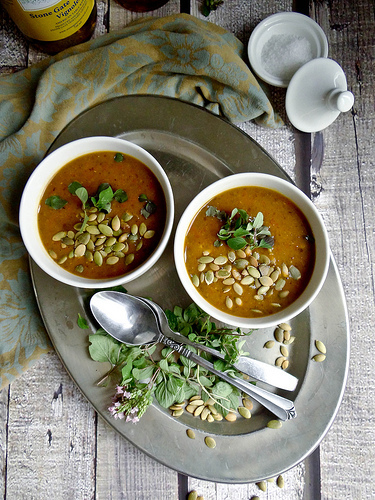 Thank you Sarah - this has been one of my favorite soups so far this fall! Gorgeous pics and great recipe. Def going to try this. Pinning now! Stumbled upon your blog through Pinterest, been a Vegetarian for 25 years... these are probably the best recipes I have ever come across. So simple, fresh and easy. We have soup or salad every night with dinner. I can't wait to make some of your recipes! Thank you, thank you!! Thanks for the info - I made a note on the recipe regarding your feedback on the cumin and made the recommendation of starting out with 1 tsp - we enjoy the recipe as originally written with 2 tbsp of cumin - Thanks for letting me know what you thought! I made this... and was suspicious... wish I read the comments but way too much salt. 1 tsp is probably closer to correct. Celtic was what I actually used - such good stuff and I am in love with Pink Himalayan- thanks for the bit of information :) ....maybe that is why one person found it too salty, they used table salt? Made this tonight and it was delicious! I didn't even add the agave. It was great without it. I will definitely make this again and again. Thanks for a great recipe! Thank you for the feedback Andrea, I am so happy that you liked it and it worked without the addition of agave, great to know! This was just reposted by someone and I was looking for a soup I could make without having to go out and buy more ingredients. I had all of these and just made a disastrous pumpkin soup the other day, so this more than made up for it. Thanks so much for the recipe!! 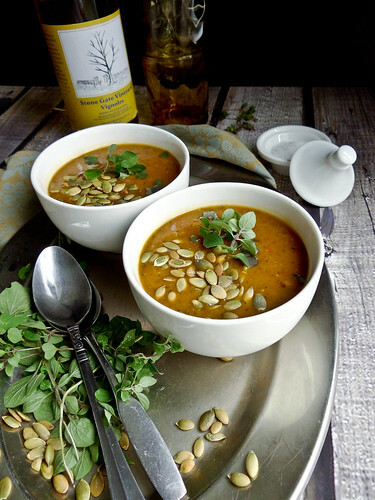 I am hoping to make this soup tonight! Do you think that real maple syrup would work instead of agave or honey? 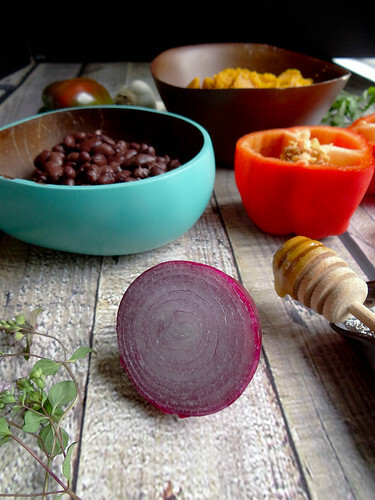 You might also enjoy sites like Blue Apron and Hello Fresh!